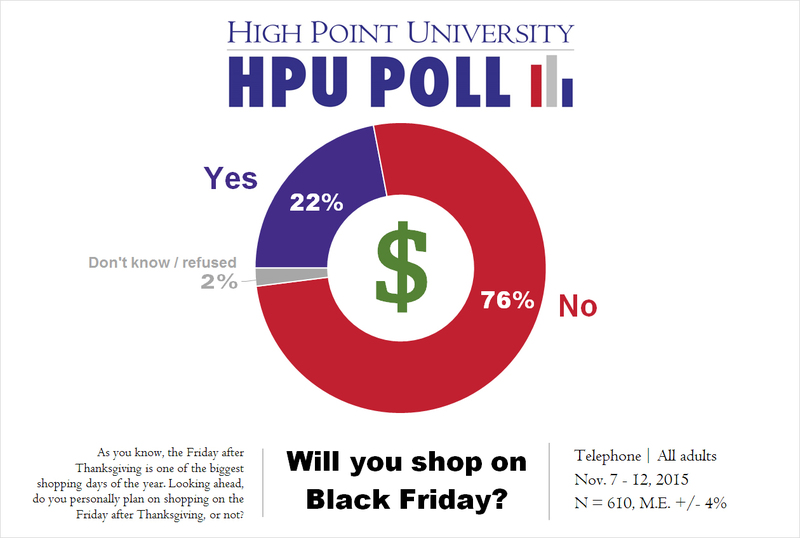 HIGH POINT, N.C., Nov. 23, 2015 – The High Point University Poll has found that an overwhelming majority (76 percent) of North Carolinians do not plan to shop on the Friday after Thanksgiving, known as Black Friday. Almost the same number of respondents (78 percent) will be staying out of the stores on Thanksgiving Day as well. This sentiment is echoed when asked their opinion about businesses that require their employees to work on Thanksgiving Day. A majority of respondents (69 percent) disapproved of businesses that mandate the holiday for employees. When North Carolinians do shop for the holidays, they plan to do most of their shopping at brick and mortar stores (51 percent) versus solely online (27 percent). “The question still remains whether stores will bring in the same amount of profits on Black Friday because people are more likely to spend time with their families on Thanksgiving and the day after,” says Dr. Daniel Hall, assistant professor of economics at HPU. A majority (57 percent) of North Carolinians say they’ll spend the same amount of money on the holidays this year compared to last year. When asked how much they plan to spend, the poll found that on average, $1,009 will be spent on gifts, food, decorations and other items related to the holidays. As you know, the Friday after Thanksgiving is one of the biggest shopping days of the year. Looking ahead, do you personally plan on shopping on the Friday after Thanksgiving, or not? Do you plan to do most of your holiday shopping in bricks and mortar stores or online this year? Do you plan to shop in any stores that will open on Thanksgiving Day? Some businesses do not require employees to work on the Thanksgiving Holiday, but others do require their employees to work on Thanksgiving. Do you approve or disapprove of businesses that require employees to work on the Thanksgiving Holiday? Thinking ahead to the holiday season, how much do you think that you will spend this year on gifts, food, decorations and other items related to your celebration of the holidays? *Calculated based on n=542 numeric responses. Do you think that you will spend more, less or about the same as last year on gifts, food, decorations and other items related to your celebration of the holidays? 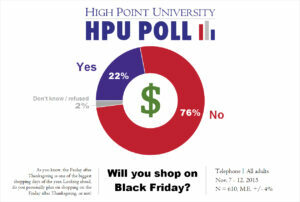 The most recent HPU Poll was fielded by live interviewers at the High Point University Survey Research Center calling on Nov. 7 – 12, 2015. The responses from a sample of all North Carolina counties came from 610 adults with landline or cellular telephones. The Survey Research Center contracted with Survey Sampling International to acquire this sample. The survey has an estimated margin of sampling error of approximately 4 percentage points for all adult respondents. The data is weighted toward population estimates for cellular and landline telephone use, age, gender and race. In addition to sampling error, factors such as question wording and other methodological choices in conducting survey research can introduce additional error into the findings of opinion polls. Details from this survey are available at http://www.highpoint.edu/src/files/2015/11/42memoB.pdf.